Maple Gate Freight Systems Inc. offers customized logistical solutions to clients wishing to ship goods within North America. We have facilities in both Canada and the USA including Los Angeles, San Francisco, Chicago, Toronto, Montreal, Vancouver and Calgary. Maple Gate Freight Systems Inc. transports goods within Canada, within the USA, as well as across the border between Canada and the United States. As a company that has been in business for many years, Maple Gate Freight Systems Inc. understands the process of shipping freight across the border. For example, we know that in order for us to deliver your goods to the requested destination across the border in a safe and timely manner, you will have to complete the necessary documentation to clear customs at the border. We can help you through this process. 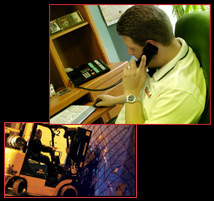 Maple Gate Freight Systems Inc. realizes how valuable your time is. Therefore, we have taken the liberty to compile a list of forms, including customs forms, that our customers need to fill out in order for Maple Gate to be able to transport freight within Canada, the USA or across the Canadian-USA border in a hassle-free manner. Feel free to browse through the list of forms we have posted, download the forms necessary for your shipment and complete them in full. You will require Adobe Acrobat Reader in order to view this form. If you do not have Adobe Acrobat Reader, please click here to install. The following is a list of forms recommended by Maple Gate Freight Systems Inc. Please contact US and/or Customs to ensure that all necessary forms have been completed. Click on the links below to access the forms you need. If you have any further questions or require any assistance or clarification, please do not hesitate to contact us by Email or by phone at 905-567-8810 or toll free at 800-320-0524. Online Forms | Maple Gate Freight Systems Inc.